The possibilities are endless for what you can put on the inside AND the outside of these adorable little mint tins. That’s because you can fill them with mints, candy, confetti, coins and so much more AND you give it the personal touch by adding a label that you design from an exceptional selection of colors, themes and customized titles for weddings, showers or any special occasion. Each white metal rectangular mint tin measures 2 3/8” x 1 7/8” and has a sturdily constructed hinged bottom and top - perfectly fit for the application of the personalized label of your choice. 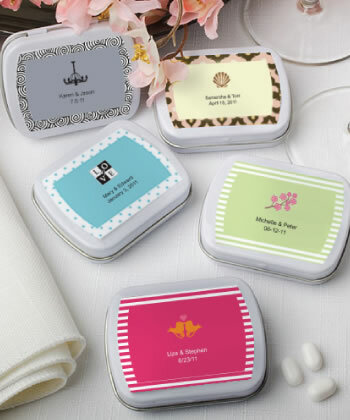 Sold only by Fashioncraft, these mint tin favors come bulk packed with self sticking label sheets included for you to easily apply. Please allow 3-4 days for production. Copy & Paste your choice of color and design from the above link into this field.